Enjoy this 20 minute training video for hints & tips on using our multi-purpose products. Scroll down to bottom for transcription of training video. Each Gypsy Rose product on the Gypsy Rose training video is only featured for a few mins in order. The Gypsy Rose training video is also full with expert tips on usage and interaction . Karen the creator is presenting the training video as a mini demonstration, with the passion and knowledge she has acquired over past few decades. The training video CD is a true testimonial to Karen’s acute understanding about her Gypsy Rose range. Karen has tirelessly for nearly 30 years, physically walked her talk and handed out 1000’s free shampoo samples a year. In addition, to this day no advertising has occurred via any major media outlets, TV or newspapers. Hence still growing and attracting solid Australian support and worldwide success. Gypsy Rose will always continue on with the same passion and energy it started with! 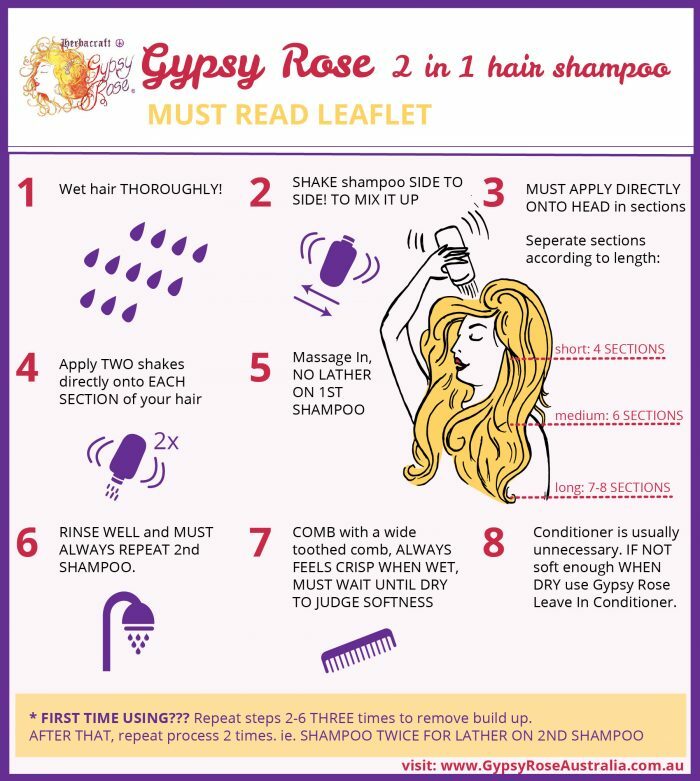 How to use the Gypsy Rose Shampoo? This Gypsy Rose Training video includes answers to all the questions she mainly has recieved since its birth. Including the most important from her hairdressing career days in her salon. There was many Gypsy Rose ‘Show Times’ events in exclusive natural organic stores and health shops throughout QLD. As a result, this training video CD came about with an aim to reach more people in the exact same way she does in store. Its been impossible to put herself in Gypsy Rose widespread exclusive stores everyday. As she is still ‘hands on’ in formulating, distributing and day to day business activities. So the Gypsy Rose training video was put into action and finally completed. She did the entire filming demonstration in one take without a script. Rather to even her surprise, at the viewing of the footage it seemed like she’d simply nailed it, in a nutshell! Hello. My name is Karen Ellis, the creator of the Gypsy Rose Hair and Body Range. Come here to the front of the wagon. The Gypsy Rose Range was formulated during my career as an environmentally-friendly hairdresser. Gypsy Rose and my company is set up to aim to fulfil my dream to save the old-growth forests. 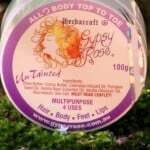 Gypsy Rose is 100% biodegradable, multipurpose, and untainted. Truly, a unique range. Let’s go and have a closer look at the range. Welcome to my short demonstrational DVD. Gypsy Rose was born in 1993. My deep concern for the environment and a dream as a young adult has propelled me along to set up my company to try to aim to do so. So let’s go in and have a deep look at the products. 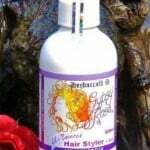 And here we have the Gypsy Rose 2-in-1 Shampoo, a signature product. It is pH-balanced, so there is no need for conditioner. There are two types, the lavender and rosemary. The lavender is for people with thick hair, that they want to flatten their hair and settle it down. 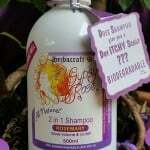 The rosemary is for people who want volume and root lift, for generally thinner hair. You must apply directly to the scalp. Not hand-to-head. There are no chemical in my supplies, so you do a double-action salt shake directly on to the head, like this: “Ch-ch.” So that’s a double-action: “Ch-ch.” Four double-action salt shakes for short hair; medium, five, six; and long, seven, eight. We don’t go: “Drip, drip,” and we don’t do a one shake. We do a double action. Just like shaking salt on your meal. Your hair will feel crisp when it’s wet, but it dries like silk. The first time around, though, to remove the build-up, you must do three washes in the first shampoo. So you wash once, rinse out; wash the second time, rinse out; wash the third time, rinse out. After that you always do two washes per shampoo. The most important thing is that you read the leaflet and that you do a two-week trial, because that will fulfil the build-up removal. 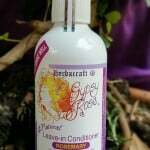 And here we have the Gypsy Rose Leave-in Conditioner. So, it’s an instant hair shine leave-in conditioner. There are three uses and two types. So, multipurpose, three uses. It’s a leave-in conditioner for dry hair, so on the days that you’re not shampooing your hair you can spray it on your mid-lengths and ends. You must shake before every spray. There’s no chemical emulsifiers, so you have to mix it up. So shake before every spray, middle lengths and ends only. Leave-in conditioner for wet hair, same application but you can do it after you get out of the shower or after shampooing, because you’re having trouble combing out. And it’s a full head and scalp treatment. It’s amazing. So instead of paying the hairdresser to do that for you, you actually can do it yourself at home. So you leave it in three hours maximum, but some people leave it in overnight because they’re feeling comfortable with it, of course on an old pillowcase. It is an oil, but it’s blended beautifully and light. Its a very light spray so it doesn’t leave an oil, but it will give an instant shine. So the coconut oil is the only hiccup. It will actually solidify in the cooler temperatures, but that’s okay, that’s a natural process. So what you need to do is pop it in a pot of hot water, leave it on the bottom of your shower tray while you’re showering so it’s really when you go out, or alternatively, put it in the window ceil in the warm sun. And here we have the Four-use Multipurpose Hairspray. So it’s a multipurpose hairstyling aid, so it has four uses. Hairspray. Number two, replaces your gel and mousse. Number three, quickset. Number four, it’s a pre-blow-drying aid. Incredible product. This is one of my favourite products. So without this, my hair would not look as defined as this. So what you actually do with the hairspray is you must, again, shake before every spray; no chemical emulsifiers. Shake, spray, shake, spray. As a hairspray, you shake and you spray all around your head once you’ve got it into place. That’s one layer. And you wait 30 seconds, then you do a palm touch test. Oh, yes, that’s firm. You can do another layer. After four layers will be great for you on a windy day if you’ve gone out. You can do as many layers as you want, and it brushes out tomorrow. So you don’t need to wash it out. It just dissipates because its base is actually rainwater, vinegar, sugar. It’s incredible. The gel or mousse you actually spray. Shake and spray really close, like I’ve done today, and you get that defined look. Then quick set is actually you don’t want to blow dry, for people who don’t want to blow dry, and you actually just towel dry your hair after shampooing, spray it all through your hair, push it into place, brush it into place. Just have it exactly how you normally wear it. Let it dry stiff and hard, and then re-brush or comb or style it the way you normally would, and it actually looks like you blow dried it, so it’s a little bit of a cheating thing. Then pre-blow-drying aid, it actually protects your hair from the dryer, so you actually spray it all through your hair after you’ve towel dried and before you blow dry. It’s probably not the best thing for conditioning your hair or protecting it before hair straighteners. That would be the leave-in conditioner. So yeah, shake before every spray, brushes out the next day, and it’s very, very forgiving. So you can think: “Oh, I’ll go overboard, I’ll go sticky,” but you won’t, so don’t worry about that. And here we have our latest product, the Gypsy Rose Liquid Hand-Body Wash. So it’s a multi-purpose body wash. It’s not for shampooing or for your face, but it is multipurpose, it cleanses, exfoliates, and moisturises. It is incredible. After you cleanse, you actually feel like you’ve applied moisturizer. So if you want more lather than what it actually gives, you can use a body brush or a loofa. How you actually do it is you just simply squirt one squirt on to your body or your hand, however you want, but that will cover a large area. One squirt will cover a large area. You’ll get that light, flat lather. But if you use a loofa or a body brush, you’ll get a proper creamy lather. That’s really up to you. It really makes no difference. It’s just the feel of it that suits some people. There are two types, the lavender and rosemary. The lavender is actually for extra-dry skin, and of course the rosemary is from normal to oily. You must rinse it off well. You’ll notice that it’s just so beautiful, it feels like a cream. You know that you have to rinse it off well. 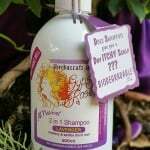 It is actually the same ingredients as the shampoo, but it’s a different formulation. So it’s very, very important that you don’t use it for shampooing. And here we have the Gypsy Rose Facial Soap Mixtures. You can use them on the body. Basically, there’s three uses and three types. So they’re your cleanser, toner, and moisturiser. The three types are normal, oily, and dry. They last up to six months on the face minimum. You normally would cut your piece out and you can store that and the rest of the soap in our tin that we supply. It’s actually shrink-wrapped inside so they’re protected and that’s long-lasting freshness. If you overuse them, you will exfoliate and dry up because they’re so concentrated. They give you an amazing sheen and softness to your skin even when you’re not wearing makeup. Made the old-fashioned way, cured for three months. So the three types are the dry, normal, and oily. So the dry is the red colour code, the normal is the apricot colour code packet, and then of course your oily is the purple. So the oily one is quite famous for teenagers, that works really well. The great thing is with the dry one you can actually have extreme dry issues happening on your body, and with the pawpaw, carrot, and orange, that’s just great. Then, of course, your normal one is for sensitive, the almond, honey, and cinnamon. But your oily is the lavender, clay, and apple cider. So the way you use them is you cut your quarter piece out and you splash your face with warm water. You get the piece of soap and you wipe that directly on to your face. You put one film on your face, stop, and then you do one wipe with your hand, stop. Rinse off with warm water. Do that twice. Make sure it’s all gone at the end with warm water, and then splash with cold. That should tone up. No moisturiser needed. You can use our Rosehip Oil in colder, drier temperatures and just pat that lightly on your face, but generally all year round you won’t need that. Yeah, so very, very, very, very good for your skin, but you must use them the right away. 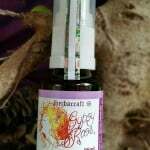 And the Gypsy Rose Rosehip Oil. Three uses: For your eyes, your neck, and you can pat on your face. It’s 100% rose essential oil in it in a base of apricot kernel oil. Of course, apricot kernel oil is vitamin A, C, and E. So it leaves no shine. Instantly all rosehips will leave shine, which is why most people put it on at night. This one you don’t have to. Try it. You just squirt it on to your neck, push up when you apply to your neck, and you’ll see no shine. For your eyes it’s a little bit on to your fingertips and push in. Then in wintertime or with your facial sets if you need a bit more moisture, you can actually what’s left over in your hands after doing your neck, you can just pat lightly on your face. You don’t actually need to apply it liberally on to your face. It goes a long way. It’s got a gorgeous smell. It’s a three month’s supply for the 25mL, and of course, this is the 50mL bulk buy. It hides age spots and it smooths wrinkles. 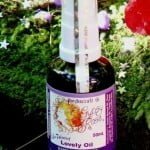 The Gypsy Rose Lovely Oil. Three uses. All the Gypsy Rose products are multipurpose, which is fabulous. Let’s get all these things out of our bathroom and simplify things, that’s sort of the reason why we did it that way. The three uses for this one are burn, wear, or put in your bath. It’s an invasive cold press sweet almond oil with 100% essential oils, bergamot, rosewood, ylang ylang, and patchouli. So it’s absolutely lovely and it smells different on everybody. How you use it, of course, is just wear it as you would a normal perfume even though it’s not a perfume. It is all oils, but you can wear it that way. Burn it in your burner as you normally would. In your bath, you just need to disperse it, so you would need a tablespoon of milk just to disperse it into the water, but it’s absolutely lovely. 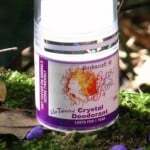 The Crystal Deodorant, the Gypsy Rose Crystal Deodorant. It is the highest quality. We only use the highest quality. You can usually tell by the process of crystal deodorants, but you’ll always find that if it’s a roll-on, you’re up in the highest quality. It’s unscented, there’s no harmful element in. It’s a roll on and it lasts 12 months. It’s really, really convenient, so you can carry it around with you. Multipurpose, you can use it on your feet, under your arms. The brilliant thing is it has a negative charge, so it doesn’t pass through your cell wall. What is it? It is natural mineral salts. What more do you want? It works. And here we have probably the most multipurpose product I’ve ever made, which is the Gypsy Rose All Rounder Body Top-to-Toe. It’s got four uses, and it’s one type. So the four uses are for your feet, body, hair, and lips. The storage is that in winter it will go harder, and in the summer it can go softer. Don’t ever lock it up in a hot car or it will melt down, without any effect to the performance, of course. The brown on the bottom is the vanilla sentiment of the vanilla essential oil. It changes colour over time as well. It can start to go white, you’ll see more of your cocoa butter coming through, with no effect to the performance. It’s amazing all-round, and it lasts and lasts and lasts, and you don’t need to use much. A little goes a long way. The four uses are for your lips you just simply touch it and apply to your lips. You may feel a tingle, that is the salt if you have any issues there. Then for your feet, there’s a little spatula in there and you would scrape off a full spatula and you would rub vigorously on your feet, and you can also use a pumice stone there for stronger issues where you need to really remove the dead skin. For your hair you actually just scrape a little bit out, a very thin film on your hands and you would just wipe that on to both hands and then wipe it into your hair. So whereas the hairspray I’ve used today to get that scrunched-up look, this would be more for the people that straighten their hair and they want that separate look, a bit like you’d use a wax. It hasn’t got wax in it, but it would give that effect. So it is brilliant, giving you that separate look to all your layers. And of course for your body, you would just scrape out a little piece, probably about the size of your little finger nail and you would wipe on to that, it would take up that whole arm area and you would rub vigorously. You will feel warmth. In some cases you can see your skin go pinker, but it is just incredible how it leaves your skin feel. The body wash actually does leaving you feeling like you’ve actually put the oil around your arm, so you could imagine if you use both together. Thank you for listening. The DVD is free. The leaflet must be read before the use of any product. Very self-explanatory. More information on the leaflet than I could fit on the labels of the bottles, so yeah, very hard to put there. On the website under each product page there are questions and answers that have been asked of me over the last 20 years. Very informative. So please go to the website. Everybody loves the website.